East on Rt.22 approximately 3 miles. Perma-Chink Systems is on the left. My experience with Perma-Chink System products dates back to 1997 when I first started helping my father with his Perma-Chink distributorship. That distributorship ended in 2011 with his retirement. But without skipping a beat, in April of 2011, I continued in the selling of Perma-Chink products as manager of Perma-Chink’s new PA store. “Working with this company and now for this company has made me Perma-Chink Proud”. Personally I would prefer my title to be a Perma-Chink “customer advocate”. I know how I like to be treated when I am considering purchasing a product for the first time. When helping customers on the phone I can hear their tone change once they realize I’m not going to “Just take their order”. I want to know about your project and help you get the maximum benefit from the Perma-Chink products you need. I also enjoy the challenge of getting the log home contractors what they need when they need it in the most economical way. Although I have only been with Perma-Chink Systems since February 2015, I have had many rewarding experiences with this company and our customers. Each home is unique and it’s great to be a part of our customers’ projects by offering the right products and sharing knowledge and ideas. It is very satisfying to know that I have done my best to help someone realize their dream and be able to enjoy their log home for years to come. Construction and home improvement have been interests of mine for many years. My father’s major at Penn State was engineering and my brother spent his lifetime as a logger here in the hills we call home so you could say it’s in my blood. After my military service and years away from home, I returned to my roots in central Pa. When the opportunity was presented to me to become part of the Perma-Chink family, I knew it would be a perfect fit. The outstanding products we carry, the professional contractors we work with, and the expertise of the people in this company have helped me learn more every day about the log home industry. I’m honored to be part of the Perma-Chink family and to serve our customers to the best of my ability. I started working for Perma-Chink in July of 2012 when I was hired for shipping and warehouse. My duties are now split between the warehouse and sales. In the warehouse I am responsible for ordering and keeping product in stock from the Knoxville factory. I keep equipment and machines in working order to avoid any down time. As a sales representative I’m available to help customers gain knowledge so they can choose the right products and quantities for their project. In peak times I’m helping process the on-line orders in our territory as well as assisting the shipping department to help achieve our goal of “Same Day Shipping”. Interestingly enough, my background is actually in agriculture and animal science. After gaining a couple years experience in animal science research after my graduation from Penn State I moved over to sales, chasing new opportunities. While I have little direct experience in the log home industry, I am an avid carpenter and always look forward to learning more. Since August of 2017, I have been taking calls as a Perma-Chink sales representative. I’ve been helping in the warehouse as needed, anything from shipping to breaking down product. Like Linda, I prefer to be referred to as a “customer advocate”. I’m always here to help customers gain the knowledge they need for those DIY projects, ensure they order the products they need, and ship it as affordably as possible. I like to let the quality of our product speak for itself; I’m always here to answer any question you may have, just let me know how I can best help you. 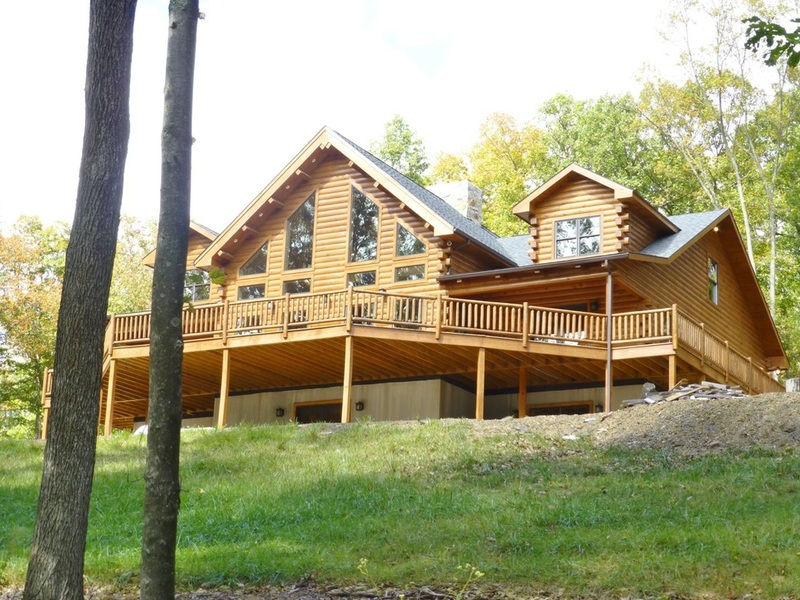 Bear's Paw Lodge in Pennsylvania chose Perma-Chink Systems for their lodge retreat. The exterior was finished with Lifeline Ultra-2 in Dark Natural, with Lifeline Advance Satin topcoat. Everhart Painting, a Perma-Chink Systems Preferred Applicator, performs maintenance of the lodge. One of the oldest (if not the oldest) log homes in the community of Belleville PA is being restored with Perma-Chink sealant. Owner John Zook of Zook’s Masonry is getting help from Philip Hess Contracting of State College PA for the renovation. Below is an article that appeared in the fall 2017 issue of Kishacoquillas Valley Historical Societies newsletter. The recent pictures show Perma-Chink Stone color being applied with a Kodiak chink pump. This piece of history sits along the street of this quaint small town with a beautiful view of “Big Valley” from the back windows. Watch for updated pictures as the renovation unfolds. Liberty Log Finishing media blasted, applied Shell Guard RTU, sealed checks with Perma-Chink Sealant and backer rod, applied Prelude and Ultra-2 Cedar and Gloss Advance Top Coat. Before work is the image on the left, completed project on the right. 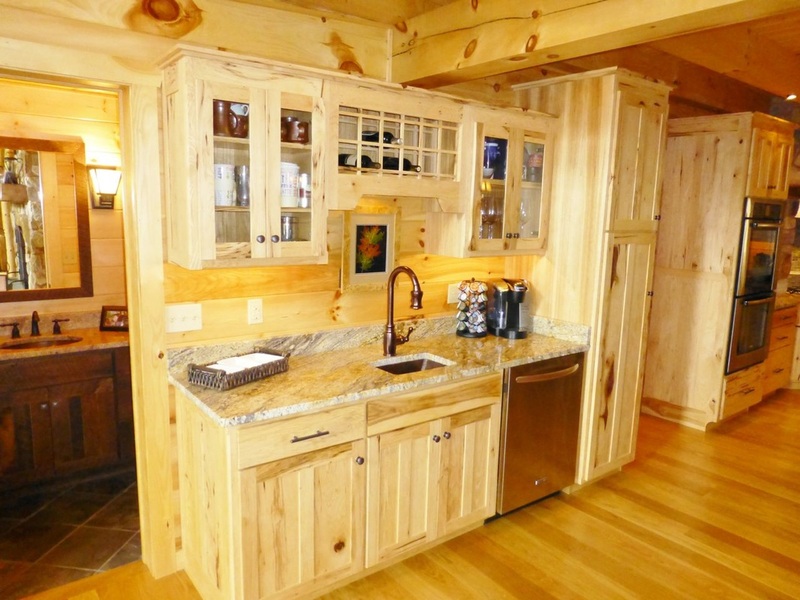 Ward Cedar Log Homes in Maine have some amazing homes finished in Perma-Chink Systems' Lifeline Ultra-2 in Cedar. The home was blasted with glassbead, then the surface was prepared for stain with Osborn brushes. The exterior was finished with Perma-Chink Systems' Prelude primer, Ultra-2 Bronze, and Advance Satin topcoat. Exterior trim was finished with Lifeline Accents in green. For the interior, the home was blasted and prepped with Osborn brushes. The homeowners decided on utilizing Prelude, Acrylic Satin to keep a natural wood finish, and chose Energy Seal Natural Pine. Interior trim done in Accents Espresso, contrasting beautifully with the natural color of the wood. Amazing restoration projects from Brian Russell of Homestead Blasting in Hillsboro County, NH. Come back to see work-in-progress images, or visit their website https://www.homesteadblast.com/. Blasted, washed, and ready for stain! If you own a log home or are considering buying or building one, you won't want to miss this valuable opportunity. 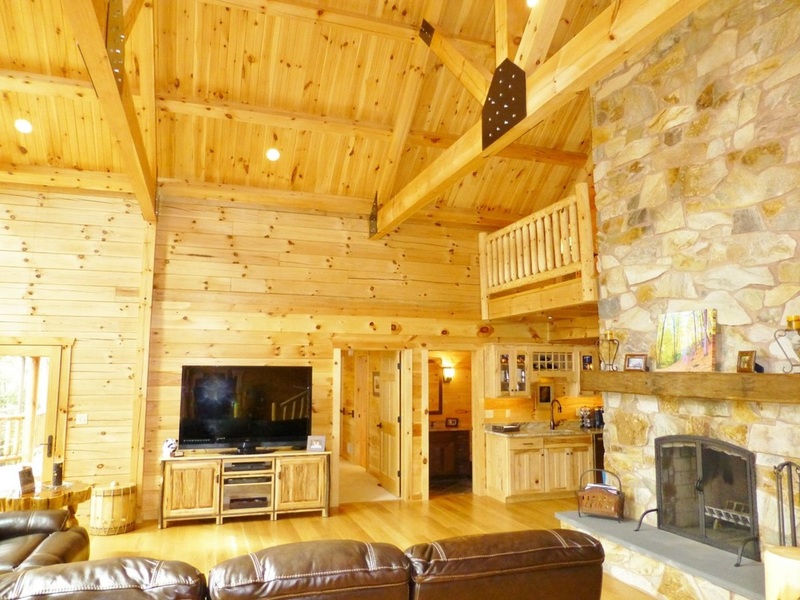 View all Perma-Chink Systems Homeowner Workshops and Log Home Shows here.